The Swivellink® product was originally designed to provide an ergonomic and robust way to put operator start buttons onto custom built industrial machinery. The goal was to protect the expensive button and route the quick disconnect cable internally, because a simple wire break or damaged button can cause hours of costly production down time. We then added our camera adaptor plate to utilize the mounting flexibility to position cameras and lighting to get the best images possible. From there, we developed our sensor mounts for a quick and easy way to add part present sensors. As vision systems became smaller and lighter it was clear that Swivellink® had to shrink to fit the needs. That is when we developed the XS series. This brought about a much smaller form factor while maintaining the rigidity required for a solid machine vision system. Our kits take all the guesswork out of selecting the various parts needed to fit the application. With vision systems, monitor mounting became a natural addition. 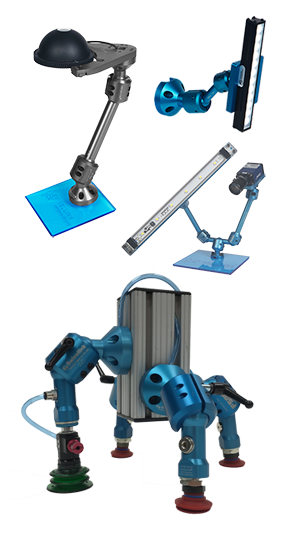 Our latest designs include applications for use with robot end of arm tools and are an exciting addition to the product family. Now distributed worldwide, the Swivellink® product line has been used for hundreds of different applications in all types of industries. Used for vision systems, cycle start buttons, sensors, lights, monitors, part fixtures, tool holsters, and robot applications. The possibilities are endless for your mounting solution.